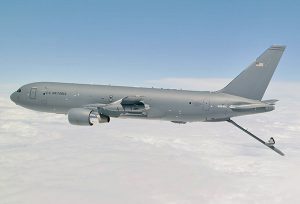 The Boeing KC-46A Pegasus is a workhorse in the air. It’s a refueler and an advanced communications hub with the ability to carry both passengers and cargo. The aircraft can accurately detect, avoid or defeat threats to our National Security. And it’s a Union aircraft, assembled by IAM Members in Everett, WA using parts fabricated by Machinist Members in the Pacific Northwest. This new tanker program will be making its debut in the IAM’s Southern Territory next month and the Machinists could not be more proud to be part of this journey. IAM Workers at McConnell Air Force Base in Wichita, KS and Altus AFB in Oklahoma, who will play host to this new aircraft, are gathered this week for negotiations with FlightSafety Services Corporation (FSSC), the company that will oversee the program. The goal is to draw up a first contract that will protect the highly-skilled workers who will ultimately make the KC-46 a legend in the sky. From training pilots to simulator technicians, load technicians, material handlers and air refueling and boom operators, the dedication and skill of the IAM will be found in every aspect of this aircraft. Negotiations between IAM and FSSC are scheduled to be on-going until January 2019. Wages, Seniority and Health and Welfare, of course, topping the priority list for the members in this group. But it’s the pride and patriotism of our Brothers and Sisters who will work on the KC-46 that is taking center stage. “It’s rare to see such dedicated employees like the ones in this group. They truly take this work to heart and their resolve not to make any mistakes is second to none. As they have told me, their main job is to take care of those who have chosen to protect this country by being part of the U.S. Military,” said Business Representative of District 70 Tyson Kelly. The same sentiment resonates with the IAM Brothers and Sisters at Altus. The post A Perfect Pairing of Science and Skill appeared first on IAMAW.